Into Thin Air and my wife and I are working our way through the Bible. To complete an Ironman and a 100 Miler. Possibly some day to do Badwater. Be the best Christian and husband that I can be. 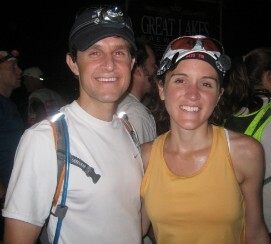 I have paced my wife for all 7 of her marathons and in her 7th marathon, her first Boston in 2009, she set a PR (3:26). Seeing her excitement as she crossed the finish line is my best marathon memory. Only 3.5 years earlier, she ran her first marathon in 4:29. Since my wife started running marathons, I have been her coach and pacer for all 7 that she has done. I have found that I get more excited when she does well than I ever did when I broke a PR. See my best marathon memory above. I have a very good sense of humor and will keep everyone in good spirits. Also, I have run 17 marathons and can provide training and race day advice. Assuming that you put in the necessary training, the actual marathon is more mental than anything. Staying positive and pushing all negative thoughts out of your mind is very important for marathon success. Also, be thankful for your blessings and the ability to run.